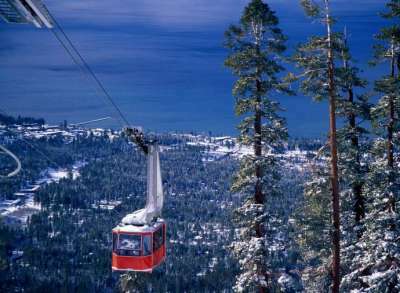 The Heavenly Valley neighborhood of South Lake Tahoe is famous for Heavenly Mountain Ski Resort and the spectacular views of Lake Tahoe and surrounding mountains that many properties afford. Situated uphill from the South Shores famous white sand beaches and apres ski hangouts, clubs and casinos at Stateline, the Heavenly Valley neighborhood has a large mix of homes, cabins and condos ranging in prices from economy to some of the most luxurious properties at Lake Tahoe. The Heavenly Valley neighborhood has homes that are within a minute or so from the lifts, with many being within walking distance to the Heavenly Tram and Calfornia Base Lodge. With two restaurants and bars within walking distance, The Himmel Haus and The Tahoe Seasons Resort, residents can have fun without the usual worries. There are also numerous restaurants located in the Ski Run Blvd area, including the Blue Angel Cafe, Cafe Fiore and Nephelles. The Ski Run Marina nearby has fishing charters, boat rentals, parasailing, The Riva Grill, and shopping. If it’s clubbing and gambling you had in mind all of the world famous action at Stateline is only a few minutes by car or bicycle. Alternative transportation options include the Blue-Go Shuttle,Uber, Lyft, taxi’s, or in the summer, the Nifty Fifty Trolley. The Heavenly neighborhood runs from Pioneer Trail on the north, the California and Nevada stateline on the east, Heavenly Mountain Resort and Monument Peak (elevation 10,067) on the south, and the Freel Peak to the west. Lot sizes tend to be slightly larger than other neighborhoods ranging from about 10,000 sf on up. Power line trail can also be accessed from the neighborhood for your mountain biking, hiking, or running enjoyment. This is a pure outdoorsman’s, or woman’s, paradise.